1AMX is regular London Brighton run attendee. This year it took the trophy for the best Dennis on the run, a fine achievement. 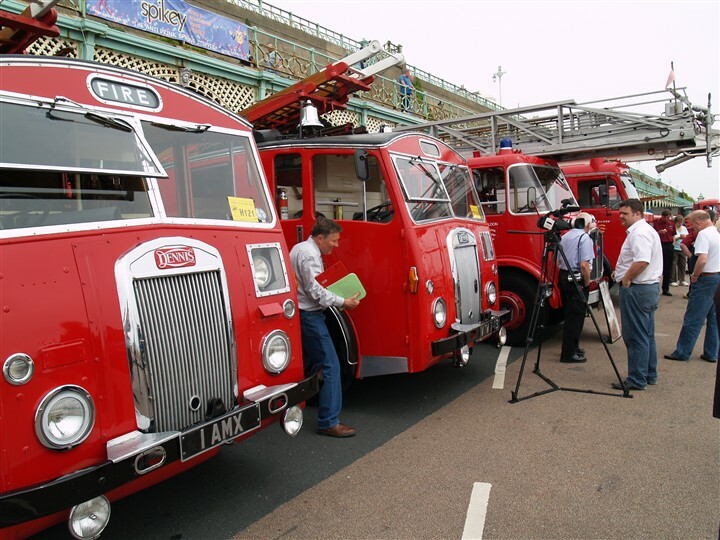 Next to it is another F12 WTW749, which came of the run in 1969 from the Essex County Fire Brigade. The TL towards the end of this group is an AEC Merryweather (HNO247B)another former Essex County FB appliance. Great shot Barry! There can't be many opportunities to see two F12s side by side thesedays and such good examples too. Added by Chris Wood on 11 May 2008. Like the AEC Merryweather TL! Added by James Marks on 05 July 2008. Doc - I got a question. From "overseas". Left front - over the head-light - the light behind the square transparent panel - is that an oscillating, or flashing, emergency light for oncoming road-traffic? And I presume the "Fire" sign, at top, is illuminated from behind. Great shot of some fine rigs, and they are "runners", too. Added by Pat Rivers-Bowerman on 05 July 2008. The light behind the square window is for 'spotting' street names and house numbers. There is an handle on the back of the lamp which pivots on a gimble. The officer in charge normally sits in the seat behind and operates the lamp when necessary. You will also notice the 'air conditioning' flap below this lamp. F12's have the Rolls Royce B80 8 cylinder engine and these always run on the hot side. This makes the cab 'cosy' on winter days and sweltering during hot summer days. (Fortunately this is not too much of a problem in England!). The fire sign is illuminated usually with 2 red/amber lamps. Originally there was just clear glass in front of the lamps and the idea of the 'FIRE' sign came along later. On my F17 TL the Belfast Fire Brigade workshops fitted a flasher unit to the lamps to improve conspicuity. The great thing about the London to Brighton run, is as you say they are all 'runners'. To get through the London traffic and then on down to Brighton (60 miles) they all have to be topline. The man on the move with the clipboard by the door of the second F12 is the fire engine Judge. As he works in the Dennis design and engineering department he really does know what to look out for! Added by Barry on 05 July 2008. I have always been disappointed to learn that the famous Hall of Flame museum in Phoenix Arizona has only two British appliances - an ERF/HCB Angus WTE and a much older Merryweather, which actually saw service in South America. I am now in the process of acquiring an F12 with an Ajax escape. Following a complete restoration - which I think will take around 18 months - it will join the other exhibits in the Hall of Flame. You may be interested to know that I intend to replicate Darlington's F12 PHN 999, including the livery, crest and fleet number, and a replacement set of license plates. I have no idea what happened to the original - which I grew up with - but I think it only fitting that it will be reborn in Phoenix of all places! Rob, was the F12 already in the USA or are you importing it especially? To see the Darlington F12 again will be quite something...even if it is subject to artistic license! Added by Dr. B.A. Hutchinson on 16 August 2018. Neither. It is coming from New Zealand. Added by Rob Johnson on 16 August 2018.